This bread answers so many questions. Like, “What am I going to do with all this zucchini?” And “What am I going to do with this overripe banana?” And before you know it, the gentle scent of cinnamon is wafting through the house and you pull this beauty from the oven. Zucchini bread as it should be, at least in my world. A toothsome crust and tender moist crumb. Studded through and through with raisins and walnuts and laced with delicate spice. Sweet, but not too sweet, and sturdy enough to dunk into a mug of coffee if the need arises. And don’t worry, I’m not gonna say that thing that people ALWAYS say when discussing zucchini bread. You know the thing I mean. Don’t make me say it! Anyway, I know it’s hot and you don’t want to turn on your oven. But just bake this when the sun has gone down and then you’ll have a perfect morning treat when you wake up. ~For zuke bread perfection, I like zucchini that is grated in tiny pieces, not shredded in long strands. To achieve this you can either hand grate it on a box grater, working in quick short motions. Or, you can chop it into chunks and pulse in a food processor, being careful not to puree it. ~One averaged-sized zucchini should get you a cup of grated. Your mileage may vary! But a 6 oz zucchini should just about do it. ~Many zucchini breads call for you to drain the zucchini prior to baking. I say “YEAH RIGHT NO WAY!” Instead, this recipe uses the moisture from the zucchini in the bread, instead of adding any additional liquid, saving you a very annoying step. You’re welcome! ~Obviously, you can play around with the add-ins in the recipe. Choose pecans or hazelnuts instead of walnuts, dried currants or chopped dates instead of raisins. Have a blast with the ingredients you have on hand! ~Sometimes on my quickbread recipe posts, people report that theirs came out flat. It’s ALWAYS ALWAYS ALWAYS because they’ve used a different sized bread pan than I do. I use an 8×4 metal bread pan for all of my quickbread recipes. Many people have a 9×5. You can use that, but yes, it will be wider and flatter than mine is, and it will bake a bit faster. ~If you don’t have the correct sized pan, I would just suggest making muffins. Bake for only 22 minutes or so. In a mixing bowl, mash the banana well, until no large chunks are left. I use an avocado masher for this. Add the applesauce, canola oil, sugar, and vanilla and use a strong fork to mix well. Mix in the grated zucchini. Would you mind approximating the amount of mashed banana, so I can stop wondering if the bananas I have are medium or large? 1/3 to half a cup. If I wanted to make these oil free woudl you suggest i UP the banana or Up the applesauce? Replace the oil with almond butter or half almond butter/half applesauce? It’s been so long since I’ve had zucchini bread or banana bread!!!! This sounds fantastic, and I have the ingredients on hand, yeay! I’m assuming it needs 3/4 teaspoon baking soda, yes? It just says 3/4, and I’m assuming it wouldn’t be 3/4 tablespoon. But it doesn’t hurt to ask, right? Oops, yes, teaspoons! I will fix post haste. 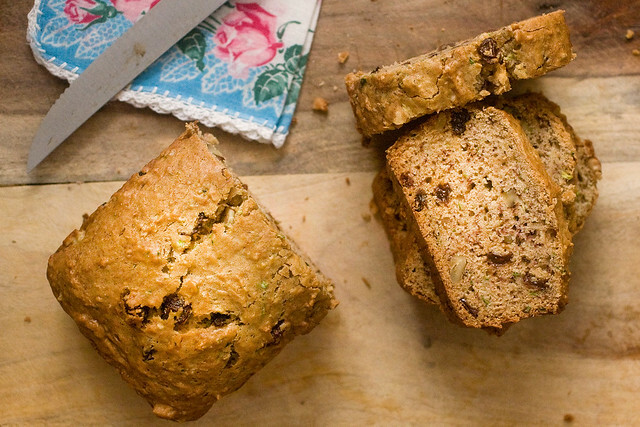 Zucchini bread and banana bread rolled into one?! I love them both so I’m sure I’d love them together. I haven’t made a quick-bread in ages either…. A friend just gave me several yellow squash. Would substituting yellow squash for the zucchini work? I thought I read this somewhere. Thanks for sharing another yummy recipe. Yep, that’ll work just fine! I notice there isn’t much extra liquid added here. Do you need to squeeze the heck out of the zucchini to get the water out or not worry about it? I only have about 50% good luck with making zucchini bread and i think it’s because sometimes I don’t squeeze the heck out of it. It doesn’t bake all the way through and is soggy. My bread pan is too big! No wonder! While I find a suitable sized pan, how long will the muffins take to bake? 25? well I guess I should read the notes section, in which you answered my earlier question about draining the zucchini. very nice. I just tried it with 1/2 cup applesauce, leaving out the oil, and it turned out fantastic! I love banana bread and I love zucchini bread but never thought to combine the two. I have a zucchini in the fridge ready to be bread! Just made it – super delicious! Two of my favourite breads in one! A brilliant idea! This sounds perfect! I have all the ingredients except I used my last zucchini last night. I do have a small yellow summer squash. Do you think that would make a fine replacement? Made this today and it is delicious!! Now, how to stop myself from eating it all….. I made this last night for my vegan son. I wasn’t sure what to expect, but it looks fantastic and tastes fantastic as well (I had the right sized pan!) I was surprised that it didn’t need the chia or flax egg substitute that is used sometime…. Would it be ok to substitute more banana for the applesauce? I make my own applesauce when I need it but it would be great to eliminate an extra step. I made muffins last night and they are so good! I used half white whole wheat and half all-purpose flour. The 6 oz zucchini and 1/2 cup banana measurements were spot on. The food processor tip was also very helpful. I don’t have a major sweet tooth so I’d probably reduce the sugar a bit next time as I think the raisins provide a nice sweetness and flavor. Just made this and it’s fabulous! Subbed in a yellow squash for the zucchini and used coconut oil instead of canola. Turned out perfectly. In fact, me and my husband polished off almost half the loaf before it even had a chance to cool down. Do you think pumpkin or oats would work as a banana sub for an allergy? This bread is simply gorgeous. Even better than he banana, date and walnut loaf i usually bake for a brunch with friends. thx for the recipe! With the second one, I replaced the sugar with agave syrup and it tasted even better. YUMYUMYUM! I just made it with dried cherries instead of raisins. Looks amazing. This was delicious. Only change–subbed vegan chocolate chips for the raisins! I will definitely be making this again and again. Any recommendations for a wheat flour substitute? Doesn’t have to be gluten free, just not wheat. Perfect for this time of year! And here in Boston it’s finally cooled off from the 100 heatwave, so I’m going to be turning on the stove once again! I just made this into muffins and they were epic. I got 9 large muffins out of the recipe. I used all banana puree (out of applesauce) and whole wheat pastry flour, and added a handful of chopped dates, too (plus the raisins and nuts). Fantastic recipe, thank you, Isa! Looking forward to trying this! If you have a toaster oven, especially one with a convection setting, it would save a lot of heat accumulating in your kitchen. You might have to adjust the cook time, but it’s a lifesaver in the dead of summer. People seem to like date or coconut sugar. My Husband HATES raisins with a fiery burning passion. What other dried fruits would you suggest? Possibly chopping up some dates? Made this a few days ago with chopped almonds and dates, absolutely wonderful! All my relatives and guests loved it. (: Didn’t have applesauce so I just finely grated an apple into the batter and it worked like a charm. Thank you Isa for another delicious recipe. I hate chunks of anything in my zuke bread, so I made a batch without nuts/raisins/etc. It was pretty good. Then I felt sorry for the lonely chocolate chips in the pantry. Amazing!!! I made little chunks of zucchini by chunking it and dumping it in the chute of my food processor. It was perfect! This recipe is delicious. I grated up a small carrot & used Craisins instead of raisins. This recipe is a keeper. Just made these for our family road trip to the beach. Since we leave before the sun comes up and without breakfast, I like to take something nutritious for the kids (and mom and dad) when we get hungry. This is perfect! I subbed cranberries for raisins and added shredded coconut. Also, I was out of applesauce, but had apple butter so I cut the sugar back a touch. It’s going to be hard to wait for tomorrow! P.S. I love your book Appetite for Reduction! Thank you Isa– these provide the perfect blissful moment (with afternoon tea) in an otherwise ridiculously tedious workday (hospital administration– need I say more??). I used the final zucchini from our garden, and made muffins since I don’t have the right size pan. They took about 30 minutes to bake completely, although this might have been because I switched up the flour (used 1 c spelt and 1/2 c barley). And since I can’t go a day without chocolate I used chocolate chips in place of the walnuts. Great recipe! I’ve made it several times substituting maple syrup for sugar, and occasionally adding some chocolate chips. Then I make my American friends guess the recipe. Thanks! This is GREAT! I added a couple eggs, used apple butter (because I had some that needed to be used up, olive oil instead of Canola, and pecans instead of walnuts. Very moist, not too sweet- just perfect! Thanks so much for sharing!!!! I made muffins instead of bread, and they were some of the best I have ever had! Nice, crispy top and moist interior. Thanks for another amazing recipe! I did a little experiment – for the banana, which I didn’t have, I subbed a dozen deglet noor dates blended with 1/2 cup hot water. I reduced the sugar to 1/2 cup due to the extra sweetness of the dates and left out the raisins. It turned out great – quite sweet still, I probably could have used only 1/3 cup sugar. Oh, and I used all applesauce in place of the oil. I ate two pieces before it was even cool enough to cut properly! Thanks for this simple and delicious way to use up zucchini. 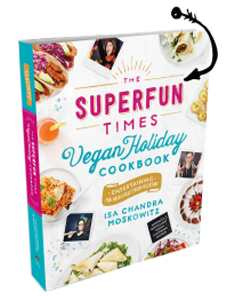 I’m new to being vegan and love your recipes…I’ve read that sugar isn’t always vegan because of the use of charred animal bones in the cleaning process. Gross. Do you use regular white sugar or a different kind? Thanks! This recipe would be a lot healthier if you substitute whole wheat for the “all purpose” flour, eliminate the refined sugar (add more flour or ground flax, or add some xylitol), and use coconut oil instead of canola (which is usually GMO). Accidentally forgot to add the sugar. The recipe came out very good. Had I added just a little bit of water or an extra 1/4 cup shredded squash, it would have been perfect. Made this the other day as muffins and used more banana instead of applesauce cause I didn’t have any. I also made it with whole whet flour and flax meal and they were a huge hit!! Even with my five year old stp-son who hates everything! Thanksso much for posting this. This is so delicious and easy! I’ve made it twice this week, once with raisins and once with chocolate chips. I made this and my husband and his friends ate the whole loaf. Well, I did get one piece. I was glad that they liked it. I used mashed beets instead of applesauce because I had some to use up. Worked great. Plan to make it again and again! Thank you for a great recipe! Yummy! I doubled the zucchini, trippled the recipe, made them into muffins. Thank you! Just tried this – I often screw around with ingredients and it’s usually not bad, but I’m not ‘good enough’ to adjust cooking times, etc. so I do sometimes screw it up. Anyways, I left this as is and HOLY CRAP, it’s perfect! Very yummy and perfectly moist. I do like to replace oil, so I will try your suggestion below for 1/2 almond butter and 1/2 applesauce and see how that turns out. Would it work to use a mild tasting olive oil? I made these into mini loaves and they rose beautifully! I was so happy. Thank you! Out of applesauce! Can I just puree apples? Any other suggestions? Cook them down first. Use any well-reviewed unsweetened apple sauce recipe you find online. I tried it, but messed it up with the cup thing and took 3/4 cups of flower instead of 3/2, buuuut, after little less than 1.5h in the oven, I suddenly had a delicious flan! Hi! I want to make these for my 1 year old to eat so I need to omit the raisins and nuts. Will this affect the the ratio of ingredients in the rest of the recipe? You’ll be ok, just a little less batter. No biggy. I made this gluten free and it turned out amazing! I added chocolate chips and cocoa powder to it as well. Mine turned out best as mini-muffins; 25 min in the oven. Thanks!! Used a combo of spelt, oat and ww pastry flour instead of AP, and coconut oil instead of canola. Turned out fantastic!!! YAY! I’m on my 4th batch of these beauties!!!! Just perfect to whip up when I’ve got so many zucchinis staring at me from every counter top. Love it both as the fat loaf or little muff muffs. My 88 year old mother who takes medical marijuana for her arthritis loves these with her medicine baked inside. She lovingly chomps them and relaxes into vegan bliss while watching her nightly Telenovelas. Thanks Isa…we love you!!!! You are amazing. I am so super happy to have found this website and all the yumminess it contains! Just to clarify, is Baking Soda the same as Baking Powder? Because I also have Bicarb Soda… It shouldn’t really matter either way, should it? can I use melted coconut oil in place of canola oil in your recipes (quick breads, cookies, apple crisp etc.)? Thanks! I doubled the recipe but added and substituted some things to make it healthier still. I added 2 eggs, used coconut oil instead of the applesauce and canola, traded one 1/2 of the flour for gluten free baking mix, and added some cardamon. Really nice texture and fantastic flavor. I make these with coconut oil instead of canola and use buckwheat and rice flour instead of white flour to make them gluten friendly as well, They turn out awesome and they are a favourite in our family! Do I have to change the recipe for high altitude baking? Wholly amazing. I just received a metric ton of zucchini from a friend’s CSA that she can’t use as she’s going away for the holidays. I remembered this recipe and had yet to try it. It’s perfect! I just made a loaf for myself, six mini loaves for to freeze for said friend and others upon their return, and another loaf (because it is THAT good and simple to throw together!) for the vet office who just helped us and our kitty recently. I don’t know the last time I was so excited to gift others a baked good! The only changes I made were: I have unsweetened organic applesauce cups for my daughter and one of those has just over 1/4 cup so I used 1/4 cup applesauce then filled the 1/4 cup measuring cup with the remaining apple sauce and enough unrefined organic coconut oil to make the measurement. I also nixed the nuts (I only have cashews and almonds on hand) and went with 1/3 cup cherry juice infused dried cranberries and 1/3 cup vegan chocolate chips. THANK YOU for this one! It’s my new go-to. Highly recommend! I haven’t made this yet but have been wanting a zucchini banana muffin that is not too heavy on the oil for ages. I just don’t think I knew it yet, but here it is! Post Xmas recipe here we come! This recipe has become my gold standard for banana bread. It is moist, delicious, and so easy to make. I often take it to parties, and so far every single time I’ve made this bread/cake for a party, I get asked for the recipe. Of course, I take them straight to the source and give them the Post Punk Kitchen website. Thanks, Isa! I just made this tonight and it’s amazing. I don’t ever have applesauce so I just used two bananas instead. I think next time I might replace the canola oil with silken tofu to see how the crumb turns out. I used a glass 9 X 5 pan but baked it at 325 instead and my bread rose just fine. This is awesome!! Banana Zucchini Bread | She can't eat what?! I LOVE LOVE LOVE this recipe! It’s my “go to” for when I want to bake something sweet but more substantial (and better for me!) than cookies, etc. I usually put craisins and dark chocolate chips in it instead of raisins and walnuts. Trader Joes has these awesome orange-flavored craisins that are awesome in this bread. I’m planning on making it tonight and using dark chocolate covered raisins…yum! Therefore, it is essential for anyone affected by this to avoid consuming anything that may contain these grains. Could this be made savory as well? Do you have suggestions for spices/herbs to use? PPK, I love your recipes! I made several batches of the muffins and I was wondering, would the muffins freeze well? I never thought of yellow squash as a sub. Interesting idea! This is the best bread ever. I think I made it about 10 times last summer. It is currently in my oven with my first zuke from the garden and I am giddy to dig in! I sub chocolate chips for the raisins. I do have to bake it for the extra time but after that it is perfect! your life. Soy – Look for tofu, soy milk, or edamame rather than soy powder. I subbed 1/4 cup cocoa for the same amount of flour and used chocolate chips instead of nuts and raisins. Mighty tasty, I must say. I made muffins because I do not have the proper size loaf pan and I don’t dig on those wide, flat loaves. It’s odd that 9×5 seems to be the standard size pan for sale in most stores, yet most recipes are for 8×4. Oh my goodness ! This is FABULOUS!!! I didn’t have raisins or walnuts…I used some chopped dates. Thank you so much for the recipe! Just made this with my own edits, turned out amazing! I doubled the recipe to make 2 loaves. I used 3 bananas in the beginning, then added one at the very end so it wasn’t as blended in as the rest (I love those moist banana spots in the bread). Also, I used a little less cinnamon, and added about 4 teaspoons of cocoa powder. Used sunflower oil instead of canola. Also, didn’t do raisins. Turned out really moist and heavy, it was delicious. I have two 9×5 (approximate) pans and no 8×4 pans so I did a quick calculation and discovered that the volume of THREE 8×4 pans is almost exactly the volume of TWO 9×5 pans (assuming an depth of 3 inches in both types of pans); 288 cu inches for the 3 8×4 pans versus 270 cu inches for the 9×5 pans. Accordingly, I TRIPLED the recipe below (thereby using even more of the overabundance of over-ripe bananas and zucchini I had on hand) and ending up with two beautiful loaves. I did need to bake them both quite a bit longer, however–about 30 mins although I checked them every 5-8 minutes after the initial 50 minutes, and I lowered the oven temperature to 325 degrees after the first 50 minutes. GREAT recipe! Everyone here at the office is very appreciative! I made muffins with your recipe this morning and brought them along to our festival…they were gone within 10 min.! Thank you so very much for this great recipe and keep experimenting – I’ll look up your site as often as I can! I just made this zucchini, banana bread and it’s delicious! I found it needed an extra 5-10 min at the lower temperature to fully cook the inside but it’s remains moist and tasty. Thanks for the great recipe I will definitely be making this one again with my current glut of zucchinis. Marry me. I did half chocolate chips and half raisin and pumpkin seeds. I just made 4 loaves of this today and that was using just 1 zucchini. I think I found a winner! I added chocolate chips instead of raisins. Thank you so much for posting this awesome recipe. I increased the applesauce to 1/2 cup and left out the oil. I am a huge fan of this recipe and have made it many times as muffins (never as bread). I make these gluten-free, add an extra 1/4 cup gf-flour and use chocolate chips instead of raisins. I have tons of zucchini from the garden and love banana bread so this is one of my favourite recipes and it always turns out amazing! I once was running low on zucchini, so I used parshnip as a subsitiute! Carrot I believe can be susituted for zucchini too! This came out absolutely perfect! I’ve always been too intimidated to try making bread, but this one looked irresistible. I brought it out to a table of farmers, and showed them where their massive zucchini harvest would be going, and it was a total hit! Thank you!! I double the recipe, leave out the oil, decrease the sugar, add more bananas and applesauce, bake in a bunt pan and give this to my 6-year-old for his school lunches. It’s a big treat and I know that he loves it and I can feel good about sending him to school with it. Coffee,Cookbooks, & a Yummy Banana Bread! I made this recipe today (as muffins) and substituted 1/4 cup semi sweet chocolate chips for the walnuts and raisins. They are delicious! So moist! I think these muffins are going to be the new favourite in my kid’s lunches. Do you think I could take out the banana next time and just add another 1/2 cup zucchini? Oh. My. God. I just made it today. I made it as muffins, a dozen of them. Changed a few things, added frozen blueberries as it was on hand, instead of raisins, and cut back on sugar, I added only a cup, had no allspice so I added a big pinch of nutmeg and it came out perfect! Actually, purrfect… I had eaten a quite a few delicious muffins in my life, but this one…! Award winner. Thank you! I like to call this ” bacchini bread.” Making my second batch this week. My kiddos love it! This sounds really good ! Banana bread is my favorite! Hey, another greetings from Germany. This bread is the solution to that weekly problem- over ripe bananas and so, so, so many zucchini in the CSA box. I foresee this being my go-to all summer long. I had no raisins, but otherwise followed this exactly. This bread was not too sweet, but definitely still tasted like a treat! Thanks for the great recipe! Could I cook them into muffins instead of a loaf and how long and what tempature would you suggest? This is an amazing recipe; totally delicious! I’ve made it as muffins and bread. Both awesome. The last time I made it, though, I got what I call the “goo band” (it’s a technical term) on the bottom of the bread. It looks like a raw spot, but it’s not raw. It’s almost gelatinous. Any thoughts on what I’m doing wrong in mixing or baking to get this “goo band”? I’ve had a similar issue when making muffins with flax “eggs,” but clearly, there is no flax here. Thanks!! Yum, I love your thinking! I made with all bananas, cut down the sugar and used dried cherries and pumpkin seeds because that’s what I had. Delicious. OMG! These just came out the oven. The smell is heaven sent. Can’t wait wait for coffee tonight!! USA, I can always depend on you. My husband loves the pancake recipe, we both adore the Chickpea piccata, and Chickpea cutlets and on and on and on…..
Made this the other day as muffins and used more banana instead of applesauce cause I didn’t have any.